This past week, as those who follow me on Twitter are aware, I had the honor of seeing Prime Minister Stephen Harper in person twice in as many days. Tuesday night, I was part of a standing-room-only crowd at the Holiday Inn here in St. Catharines. I arrived more than an hour ahead of time, yet there was a lineup of people outside the door waiting to register. As I said to someone who I met there, so much for Canadians being apathetic about politics and “hating” Harper. Of course, there were a handful of protesters on Ontario Street within shouting distance of those of us in line waiting to get in. They were screaming “Harper must go,” one was playing the bagpipes and I later heard one was waving the Palestinian flag. I continually hear people repeating the same old tired line, “We’ve got to get rid of Stephen Harper,” but I have yet to hear a single intelligent argument as to why. As Harper said during the event the following day in Welland, “During the global financial crisis, where else would you rather have been?” As I suggested to someone behind me in line, we should have chipped in to buy those protesters plane tickets to Greece. Once finally inside, we had to wait in another room before being allowed inside the main hall. Being at the head of the line gave me a distinct advantage, and I was able to grab a seat only two rows away from where the prime minister would be speaking. To say the least, he was among friends here. Here, St. Catharines MP Rick Dykstra chats with the woman who sang O Canada. Unfortunately, part of her rendition included some Quebecese, but it was thankfully drowned out by the gentleman behind me who was singing loudly in the Canadian language. MPs Rob Nicholson and Rick Dykstra pose for a fellow Conservative supporter. Many of Nicholson’s team made the trip from Niagara Falls to hear the prime minister. One woman holds up a campaign T-shirt. As he would do the following day in Welland, Nicholson introduced the prime minster. Harper then spoke for about 45 minutes. I had not seen him in person before and he came across as more of a down to earth person than I would have expected for someone in his position. As you can see from the pictures, he walked around the room a little while speaking and just used the podium to hold his notes. Not unexpectedly, I found him to be a good public speaker, but he was guilty of using the word “friends” too much. After his speech, in a moment I won’t soon forget, both he and his wife came and shook hands with me and everyone in my row. It was an honor that ranked right up there with the evening I spent with a number of former WHA players in Calgary two years ago. Though I hardly got any sleep overnight, first thing the next morning, my bike and I were on a Niagara Regional Transit bus headed for Welland to see Harper once again. After pedaling from the Welland transit terminal to the Canadian Tire Financial Services office on East Main Street, I waited outside with another large crowd. We were packed inside the small room like sardines in a tin can and I was one of the many who had to stand alongside the wall. As I said to someone behind me, I would hate to think what would happen if a fire alarm were to have gone off. Here, Dykstra chats with one of the attendees. Nicholson once again introduced the prime minister. Unlike the event in St. Catharines, this was not a party rally, but a roundtable discussion with the Ontario Chamber of Commerce. On Harper’s right was Allan O’Dette, the OCC’s president and CEO, who had a number of questions for the prime minister. The OCC had invited each of the party leaders to such a discussion and the Conservatives were the only party to take them up on their offer. As an ardent conservative, I didn’t need to be sold, but I came away very impressed with Harper’s detailed knowledge of the economy. It’s nice to know the country is in such good hands. As he pointed out, it would be a disaster for Canada if the Marijuana Party and its teenage leader or the Non Democratic Party were to form a government. In front of the pro-business audience, Harper made sure to point out the Marijuana Party leader’s most recent childish statement, where he called most small businesses tax shelters for the wealthy. Following the discussion, Harper took a few questions from the assembled contingent from the Media Party in the back of the room. Concerned more with Syria than their own country, they grilled him about the refugees, but Harper stood his ground against his political rivals masquerading as journalists. One so-called “reporter” from the Red Star chided Harper for his legitimate security concerns in regards to the refugees. After she made the ridiculous comparison to the Ukrainians who settled in Canada more than 100 years ago, I don’t know how Harper resisted the urge to point out that the Ukrainians were not fleeing a country largely held by barbarians threatening to destroy Western civilization. With the proceedings over, Harper left the stage and I turned to leave the building and return home, but not before seeing more misguided protesters outside waiting for Harper’s bus. I’m glad I was able to take advantage of the opportunity to see our prime minister and it certainly qualified as a thrill of a lifetime. Prime Minister Stephen Harper has left the Conservative Party and joined forces with Canada’s New Democrats. 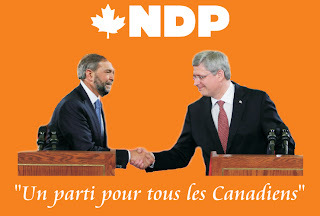 NDP leader Thomas Mulcair shakes hands with Stephen Harper, the newest member of the New Democratic caucus. On the heels of the recent Federal budget, this move has been rumored for weeks. The controversial budget, which continues to send Canada’s debt skyrocketing, brings the Conservatives so closely aligned with the New Democrats, Canada’s official opposition, that today’s announcement at Parliament Hill was seen as inevitable. 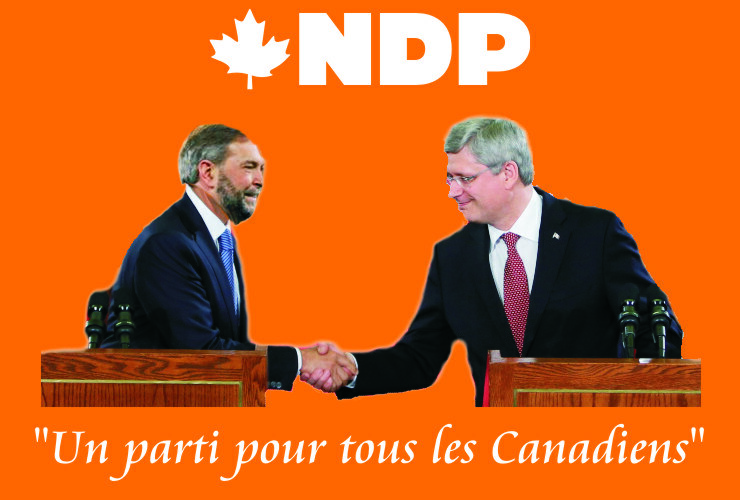 Both Mulcair and Harper deflected questions regarding the leadership of what is expected to become one unified party. However, both indicated a willingness to cooperate until a leadership convention is held. Insiders say that plans are already being made for a convention later this year in Quebec City. A spokesman for prospective Liberal leader Justin Trudeau declined comment.